I'm not a person who typically eats many sweets. My sweet tooth was pretty much cured 5 years ago when I took a series of cake decorating classes. Regardless, from time to time when the urge to bake strikes, I will bake, and indulge. I'm notorious for finding unusually named recipes and Hobo Cookies are no exception. They have no flour so I imagine they are considered gluten-free. The first thing I noticed was that it made 20 DOZEN cookies (240!!!) ...umm I don't need THAT going from my lips to my hips, so I reduced the recipe substantially! The next thing I noticed was the unusual (translate that to WRONG) quantity of ingredients listed. I knew that I would have to re-formulate the recipe for it to work. Changes are as follows (this is for the FULL batch!). Beat together the eggs, sugars, butter, vanilla, and peanut butter. Add the baking soda, and beat well. 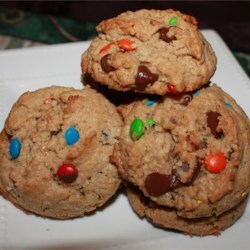 Stir in the oats, chocolate chips and M&M candies. Place dough by tablespoonfuls on parchment lined cookie sheets. Bake at 350° F (175°C) for 10 minutes. DO NOT OVERBAKE!!!!!! *The egg quantity may be increased to a total of 8 eggs if it looks TOO crumbly. *** I suggest using the mini m&m's baking pieces.